A few weeks ago I started taking down wallpaper that had been painted over. I did not realize what I was getting myself into. This wallpaper is so hard to get off and keeps ripping the wallpaper. I have been tackling it a little at a time, mainly because it does take so long to get even a little section down. For those of you who may be attempting the same, I figured I would share what I am doing to get it off. At first I tried a steamer, but because the wallpaper had been painted over it really didn’t do much. 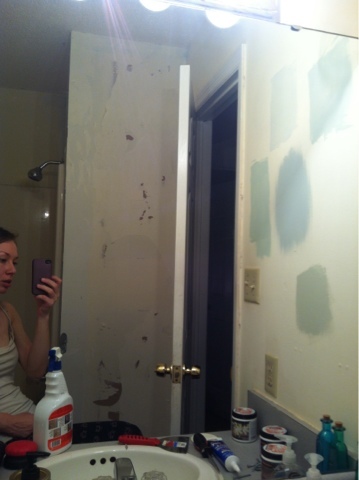 So what I have been doing is scoring the wallpaper and spraying the wallpaper remover on it. I pry a little spot of the paper up with my putty knife and pull SLOWLY. Pulling fast, in my case at least, was causing drywall to rip off with the wallpaper. The way I am doing it right now is leaving the backing paper on the wall, but I’m getting all of the painted and top section of the wallpaper off first. Then I will go back and get the remaining paper off, since it will peel super easy it will take no time to do that. Wish me luck on the rest!